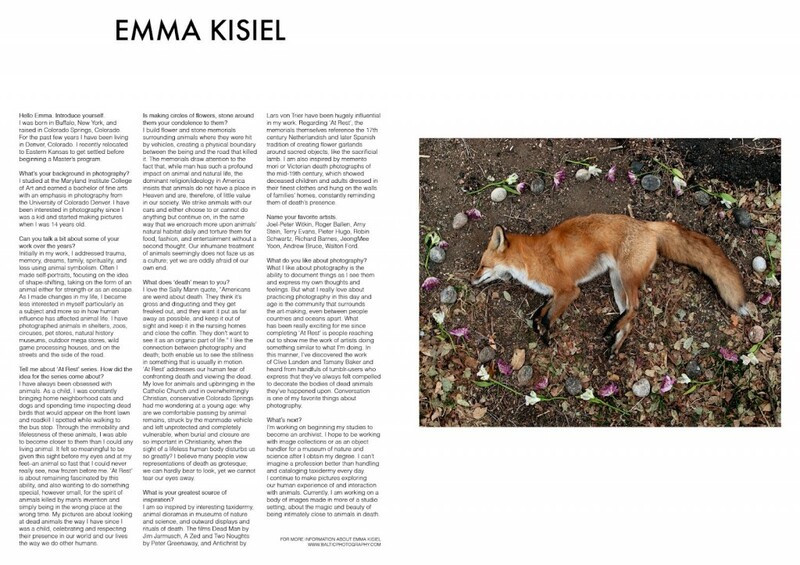 I have some images from and an interview about At Rest in the October Issue, #17 of BLINK Magazine, about which I am really excited. It’s incredibly humbling to see my name and my work next to those of such talented artists. Here are the spreads of my work and the text from the interview. You can buy printed copies and download the digital magazine for iPad on the website, blinkreflex.com. 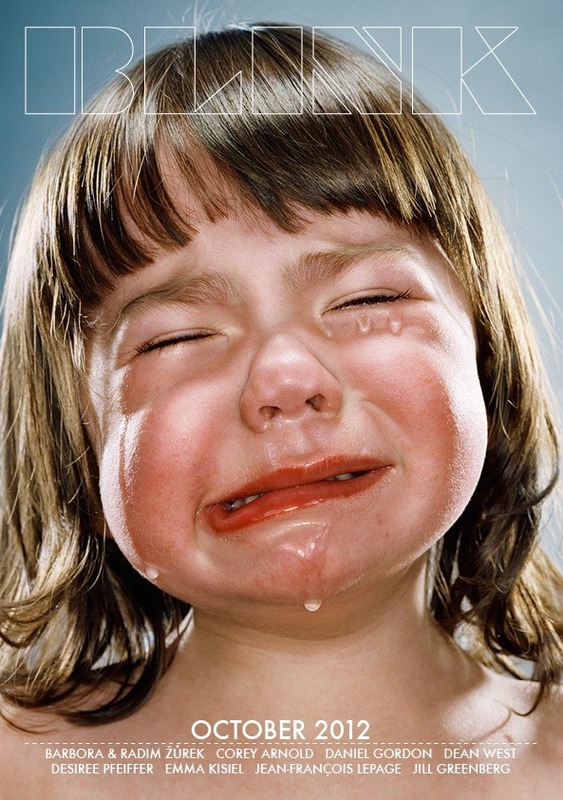 I was born in Buffalo, New York, and raised in Colorado Springs, Colorado. For the past few years I have been living in Denver, Colorado. I recently relocated to Eastern Kansas to get settled before beginning a Master’s program. What’s your background in photography? I studied at the Maryland Institute College of Art and earned a bachelor of fine arts with an emphasis in photography from the University of Colorado Denver. I have been interested in photography since I was a kid and started making pictures when I was 14 years old. Can you talk a bit about some of your work over the years? 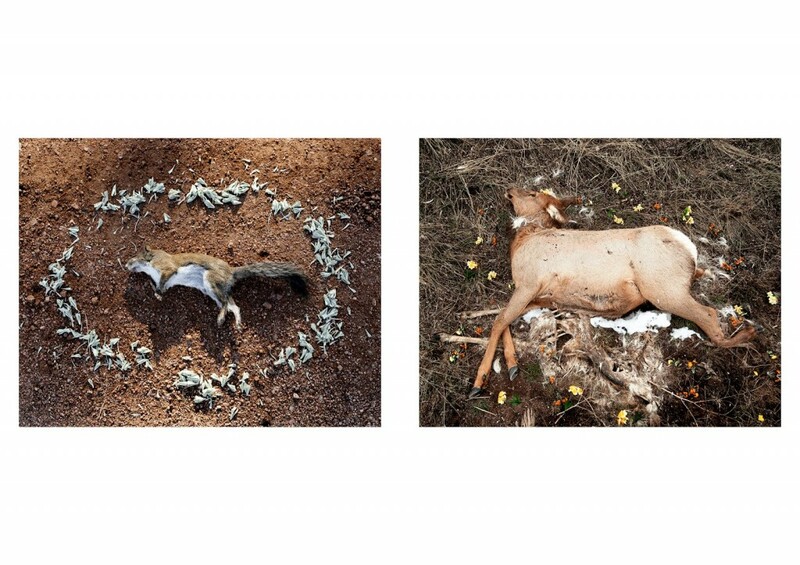 Initially in my work, I addressed trauma, memory, dreams, family, spirituality, and loss using animal symbolism. Often I made self-portraits, focusing on the idea of shape-shifting, taking on the form of an animal either for strength or as an escape. As I made changes in my life, I became less interested in myself particularly as a subject and more so in how human influence has affected animal life. I have photographed animals in shelters, zoos, circuses, pet stores, natural history museums, outdoor mega stores, wild game processing houses, and on the streets and the side of the road. Tell me about ‘At Rest’ series. How did the idea for the series come about? I have always been obsessed with animals. As a child, I was constantly bringing home neighborhood cats and dogs and spending time inspecting dead birds that would appear on the front lawn and roadkill I spotted while walking to the bus stop. Through the immobility and lifelessness of these animals, I was able to become closer to them than I could any living animal. It felt so meaningful to be given this sight before my eyes and at my feet–an animal so fast that I could never really see, now frozen before me. ‘At Rest’ is about remaining fascinated by this ability, and also wanting to do something special, however small, for the spirit of animals killed by man’s invention and simply being in the wrong place at the wrong time. My pictures are about looking at dead animals the way I have since I was a child, celebrating and respecting their presence in our world and our lives the way we do other humans. Is making circles of flowers, stone around them your condolence to them? 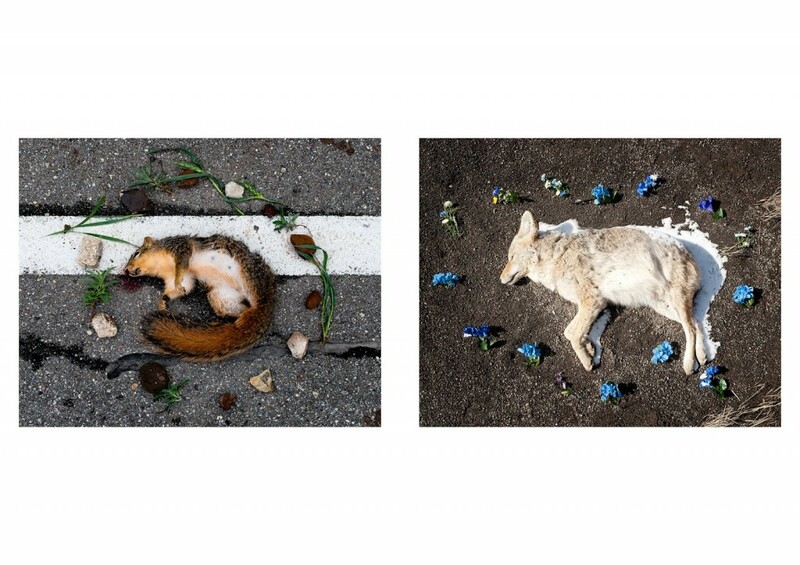 I build flower and stone memorials surrounding animals where they were hit by vehicles, creating a physical boundary between the being and the road that killed it. The memorials draw attention to the fact that, while man has such a profound impact on animal and natural life, the dominant religion/ideology in America insists that animals do not have a place in Heaven and are, therefore, of little value in our society. We strike animals with our cars and either choose to or cannot do anything but continue on, in the same way that we encroach more upon animals’ natural habitat daily and torture them for food, fashion, and entertainment without a second thought. Our inhumane treatment of animals seemingly does not faze us as a culture; yet we are oddly afraid of our own end. What does ‘death’ mean to you? I love the Sally Mann quote, “Americans are weird about death. They think it’s gross and disgusting and they get freaked out, and they want it put as far away as possible, and keep it out of sight and keep it in the nursing homes and close the coffin. They don’t want to see it as an organic part of life.” I like the connection between photography and death; both enable us to see the stillness in something that is usually in motion. ‘At Rest’ addresses our human fear of confronting death and viewing the dead. My love for animals and upbringing in the Catholic Church and in overwhelmingly Christian, conservative Colorado Springs had me wondering at a young age: why are we comfortable passing by animal remains, struck by the manmade vehicle and left unprotected and completely vulnerable, when burial and closure are so important in Christianity, when the sight of a lifeless human body disturbs us so greatly? I believe many people view representations of death as grotesque; we can hardly bear to look, yet we cannot tear our eyes away. I am so inspired by interesting taxidermy, animal dioramas in museums of nature and science, and outward displays and rituals of death. The films Dead Man by Jim Jarmusch, A Zed and Two Noughts by Peter Greenaway, and Antichrist by Lars von Trier have been hugely influential in my work. Regarding ‘At Rest,’ the memorials themselves reference the 17th century Netherlandish and later Spanish tradition of creating flower garlands around sacred objects, like the sacrificial lamb. I am also inspired by memento mori or Victorian death photographs of the mid-19th century, which showed deceased children and adults dressed in their finest clothes and hung on the walls of families’ homes, constantly reminding them of death’s presence. What I like about photography is the ability to document things as I see them and express my own thoughts and feelings. But what I really love about practicing photography in this day and age is the community that surrounds the art-making, even between people countries and oceans apart. What has been really exciting for me since completing ‘At Rest’ is people reaching out to show me the work of artists doing something similar to what I’m doing. 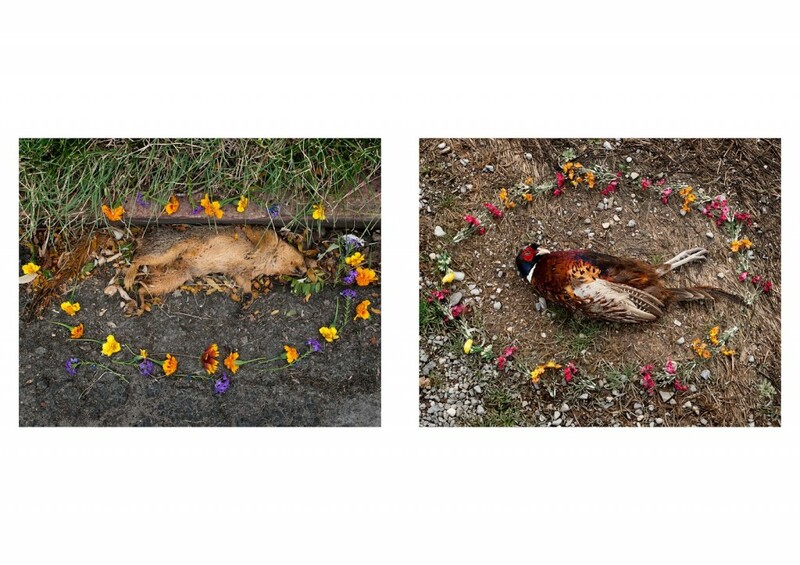 In this manner, I’ve discovered the work of Clive Landen and Tamany Baker and heard from handfuls of tumblr-users who express that they’ve always felt compelled to decorate the bodies of dead animals they’ve happened upon. Conversation is one of my favorite things about photography. I’m working on beginning my studies to become an archivist. I hope to be working with image collections or as an object handler for a museum of nature and science after I obtain my degree. I can’t imagine a profession better than handling and cataloging taxidermy every day. I continue to make pictures exploring our human experience of and interaction with animals. 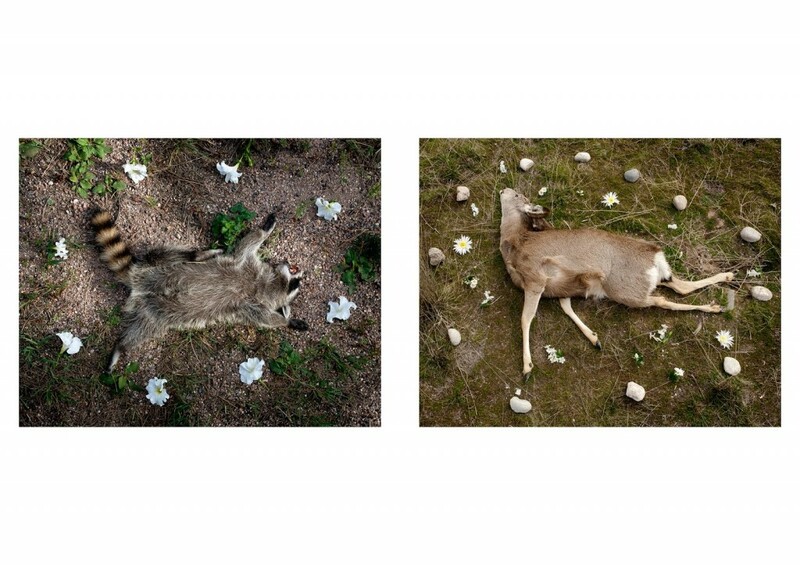 Currently, I am working on a body of images made in more of a studio setting, about the magic and beauty of being intimately close to animals in death.